I didn’t make the connection until I saw a poster in the MTR that suspiciously seemed to hint at an interesting piece of inspiration that blew my mind. Read the full story. ok, I admit, it didn’t blow my mind, but it did make me go “hmmm.” Is it just me or does this poster make Moana look like an animated remake of the Kevin Costner movie Waterworld? 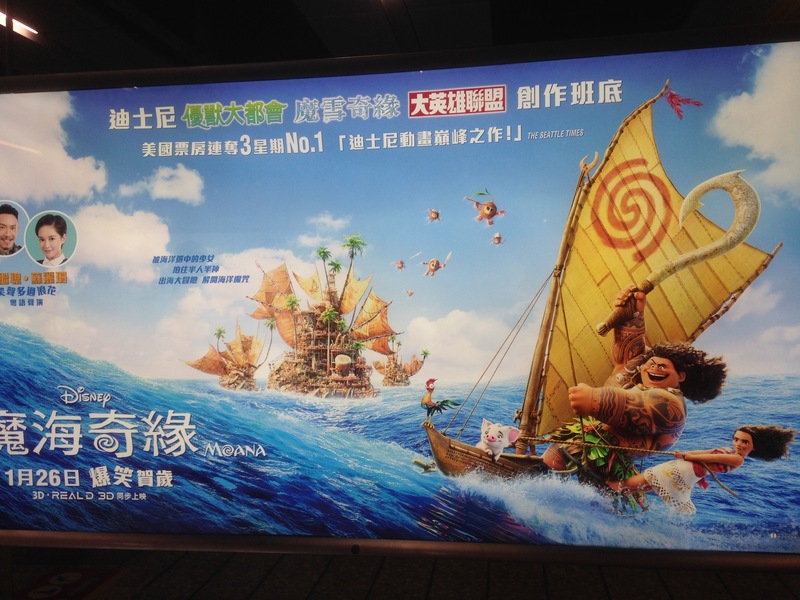 I saw this ad in the MTR today and between the trimaran looking canoe, the big hero guy and girl with grit buddy combo, and the floating city of dudes chasing them across the ocean int he background, it totally made me think of that Kevin Costner film that many remember as being his biggest box office bomb. In recent years, though, I’ve heard it’s been getting a bit more respect amongst film appreciators. In either case, compare the above MTR poster to this screenshot from Waterworld. Kevin Costner and Jeanne Tripperhorn looking like they’re realizing they should have signed up for a movie on dry land. A woman searches across the vast expanse of seemingly endless water for the key to saving civilization, only to meet a reluctant, but legendary hero who helps her battle an ocean-bound, naval army of maniacs, among other obstacles. Kind of sounds like the basic plotline of Waterworld (minus the whole fish gills, drinking your own pee, and trying to find the one last island on earth, bits though). So, of course, it’s not a remake, but it would be interesting if there actually was at least some borrowing or inspiration taken from the Kevin Costner classic. Not unusual to think, considering that Disney has done this kind of thing before. Afterall, The Incredibles was pretty much The Fantastic Four meets a James Bond movie. IT’S CLOBBERING… no, wait, I mean, uh.. I guess no cool catchphrase for us. In either case, it looks like a fun ride and another good addition to the Disney Princess movie tradition. I’ll be sure to check it out, but you can be sure that I’ll be keeping my eyes peeled for some easter eggs. Next Next post: Kung Hei Fat Choi! Now Follow These Rules!